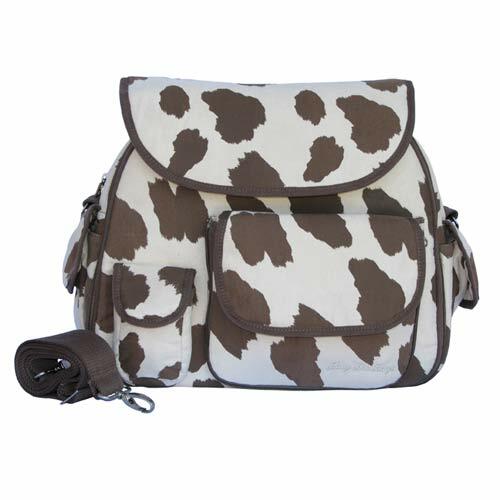 * Beautiful soft, easy to clean micro fiber fabric in a fun Cow print by Baby Bee Bags. * Main zipper unzips into a spacious storage area organized with: pockets, bottle holders and useful zippered lined pocket. * Second zipper unzips into an extra large padded removable and washable changing pad. * The one and only detachable pouch easily unzips in and out of main bag for a separate side pouch/purse. * All straps are designed to hang easily and neatly on any stroller handle/bar. * Three comfortable adjustable / removable wide straps. * Bag can be worn as a backpack, over the shoulder and/or messenger style. * Magnetic “Tic-Tac” Buttons are designed for convenient and quite access to bag. Baby Bee Bags was started by the simple need of one mom who was not willing to compromise on style and comfort, or over pay for a diaper bag. Desperate to have the perfect diaper bag, Shelly Ron, while 7 months pregnant at the time, quickly realized that in order for her to have her perfect bag, she would have to create one herself. 5 months later, Baby Bee Bags was born and so were two fashionably chic new lines of stylish, unique yet extremely comfortable and convenient diaper bags. Shelly Ron had just graduated from SDSU when she spoke with her husband, Dvir Ron – Co-Owner of Baby Bee Bags, and convinced him to partner up with her in her quest to create the perfect diaper bag. With 100% support for each other, Shelly and Dvir Ron introduced Baby Bee Bags, Modern Designer Diaper Bags for Modern Moms and Dads, to the baby apparel business throughout the United States.